Note: for this popup I asked my good friend Mitch Davis to act as sous-chef and guest bartender. 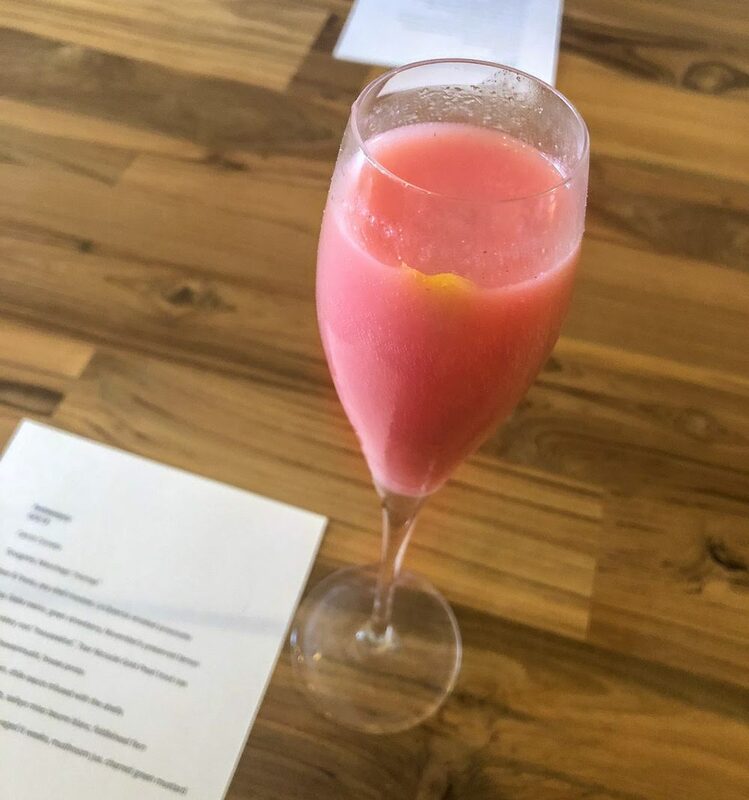 This is the first of three cocktails he developed for this menu, and the rest of this post is written by him. An ode to the populist political movement that swept Central and South America near the end of the 20th century. What started as a pink-hued, blackberry-French 75 turned into a pisco-based variation by random choice. Pisco, being a brandy, led me to thinking of another brandy-based cocktail, the Japanese. Hybridizing is a fun way to experiment with cocktails, so I took the orgeat from the Japanese and added it in there. A splash of Campari balances the whole thing out with some bitterness. Great for whetting the pre-meal appetite. For 4 servings (you will have extra pisco). Prepare the yerba mate-infused pisco (up to 1w in advance): Combine the pisco and yerba mate. Infuse at room temperature for 1.5hrs, then strain through a fine-mesh strainer. Prepare the orgeat (up to 1w in advance): Blanch the almonds in unsalted water for 1.5m. Strain and dry on a tray lined with paper towels. Blend with the 470g water until coarsely pureed. Strain. Combine with the sugar and bring to a boil; reduce the heat and simmer for 3m. Cool. Strain. Stir in the Amaro Nonino, Courvoisier, and rose water. Chill until needed. To serve: Muddle the blackberries and orgeat in a shaker tin. Add lemon juice, Campari, and pisco. Add ice and shake for 15 seconds. Fine strain into a flute and top with prosecco. Garnish with a lemon express.